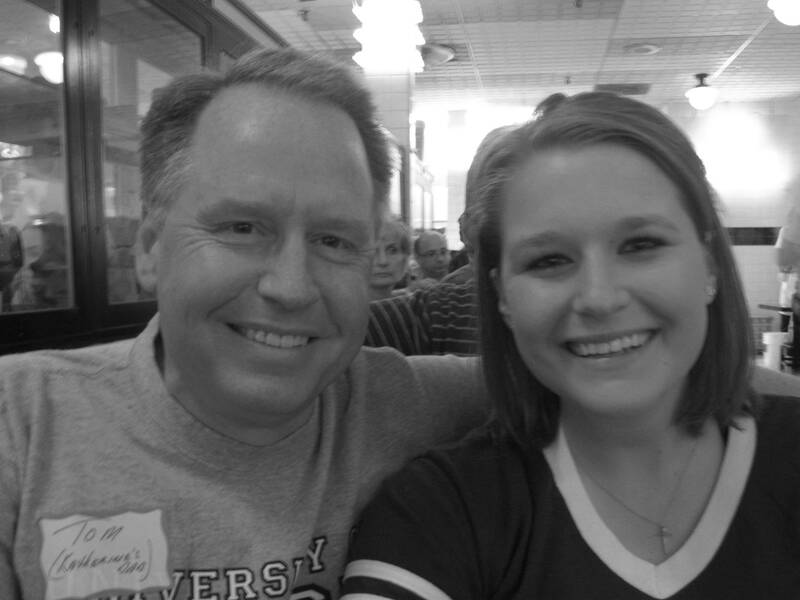 This past weekend, my Dad came to Athens for the Father-Daughter Weekend with my sorority. I was actually in charge of planning it, and I wanted the whole weekend to be an optimal opportunity for Dads to visit with their daughters and their friends. So, everything we did tried to imitate something you “do” with your dad! Hence, The Grill. When I think of my Dad, I think about pancakes. They were a tradition every Saturday morning of my childhood, and I thought many girls shared the same memory. If you don’t know about The Grill, you should. 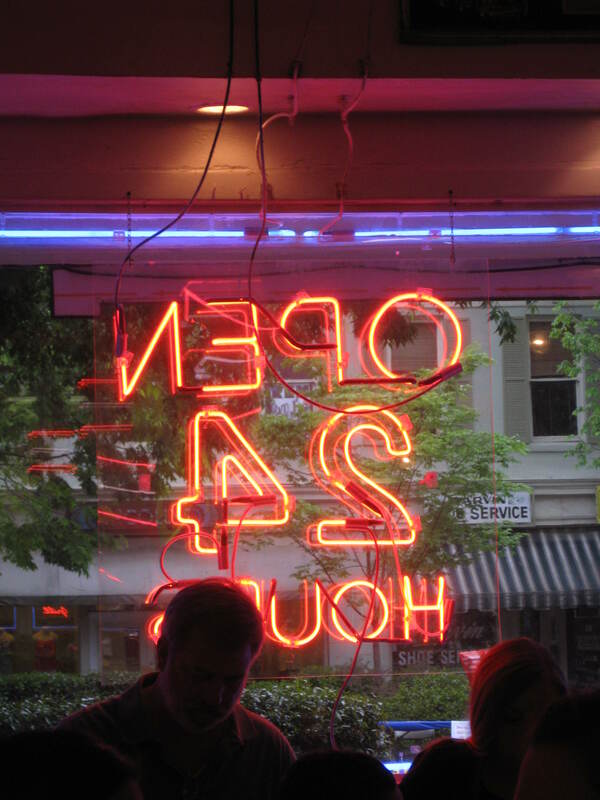 It is a tradition for many Athens visitors to stop in, and Athens locals and students love it as well. Location: On College Avenue, on the block between Broad Street and Clayton Street. You can’t miss it. Price: Very cheap and reasonable. We paid $5 each for two humongo pancakes, a meat, coffee and OJ. Best Meal: Any meal when you feel like eating greasy, wonderful food. Open and close: Open 24-hours! Group friendly: I’d say so. When I called The Grill to initially set up the pancake breakfast, their manager, Jeff Wineberg, was really excited to plan it. No one has ever done something like this with them before, so it was comforting that we were both newbies. To the food: after most of the Dads and daughters got to The Grill, our two servers took our orders. I sat at a booth with my Dad, my roommate Amber and her Dad. We gave our waitress three orders of blueberry pancakes (me, Dad and Mr. Davis), and Amber decided to go for the kill and ordered chocolate chip ones. While we were waiting, we drank coffee and chatted about the weekend so far. The people at The Grill were so chill that it was nice to have them to bring in the day. After 10-to-12 minutes or so, our yummy breakfast came. I have small hands, but my two pancakes were about as wide as one of them stretched out- maybe about eight inches in diameter. If this sentence meant nothing to you, here it is a little plainer. They were HUGE! The blueberries were nice and juicy, and the bacon was crispy. In case you didn’t know The Grill makes their own fresh squeezed OJ. I didn’t have any, but Mr. Davis said it was great. Until Saturday, I had never been to The Grill for breakfast. I think it’s going to become somewhat of a tradition. The pancakes were too good not to have again! So friends, visitors, UGA-ers and other wonderful readers, go to The Grill for some super-awesome pancakes and bacon (or sausage). You won’t be disappointed!